At first when I had seen the firewall policy, I was unhappy with another application trying to do everything to keep people to upgrade. After taking a look at it, it was a bit different as Cookie28 has noted. Basically provide access or not...but I don't want to see it try to turn into a full fledged firewall. Yes, some may not realize, but some vendors' policy is to pay for upgrades for major revisions and DeskSoft is one. If I recall, i think I upgraded to their lifetime free upgrade promotion when it was available. And why should you *not* have to reboot after installing this? Did you write the application, or do you not have to reboot after installing drivers on your system (which this does)? Trouble installing. I should not have to reboot my computer to install the program. Will probably want a reboot once its installed also. Disgraceful upgrade police - 30 days only. v5 now even works as a firewall! And it seems smarter than the other solutions, because it just asks once per program if you want to let it access the internet or not - that's exactly how I want it. - Fix: Further screwed existing customers. After I installed this I go blue screen crashes. Then my internet stopped working. It irritates me significantly that I paid full price for BWMeter (not to mention a couple other DeskSoft applications), then paid for an upgrade, yet I am STILL not eligible for free lifetime upgrades. I'll remember that, DeskSoft. Oh, yes I will. For what it's worth, DeskSoft is currently offering lifetime free upgrades on BWMeter. Love this app even with the price. I never had a need before, but recently I wanted to gather some metrics of network usage a particular application generated, so I created a new filter and used the stopwatch to record total transfer and min/max/avg transfer rate. Worked great. This new version is absolutely perfect! Locked windows can now be closed by clicking the x, windows now respond to screen resolution changes, and it keeps getting better with each new build. Great work, Desksoft! I generally agree that spending a little more for an awesome app is worthwhile but $30 is a little much. I have to agree with you, PaulieFresh. There are two bugs which drive me insane. The first bug exists when the screen resolution changes - if you're not careful the windows will disappear. Most apps will detect screen resolution changes and automatically re-adjust themselves so they remain on-screen. I use this program in an enterprise-level network where we use remote desktop exclusively. Depending on which computer we're using remote desktop from we may go from 800x600 to 1280x1024. If the meters are set to show near the edge of the screen(which I often find myself doing so they are out of the way) they can disappear when you enter a low resolution environment. Very annoying. Most other applications will snap themselves back into view so this would not be an issue. The other and most definately smaller bug (if one can even call it that) exists when the windows are locked to a particular position on the screen. The X (close) button no longer works! The way I interpret the window lock mode is that the position is locked - not that it should disable the entire window and be unresponsive to mouse clicks! Besides both bugs this application is just about perfect. It's the best in its class which is why I continue to use it. I highly recommend it to anyone connected to a network! Blaming any third party for a problem related to a Kaspersky product is like blaming earthworms for global warming. Point the finger where it belongs: At Kaspersky. I've used Kaspersky products extensively, and it's like hanging from your toes... Except not as much fun. BWMeter is great for taking statistics, if you can't or don't want to do this at the router level. BWMeter can handle remote stats, too. I've checked BWMeter against Tomato firmware's stats, and they're in exact agreement. 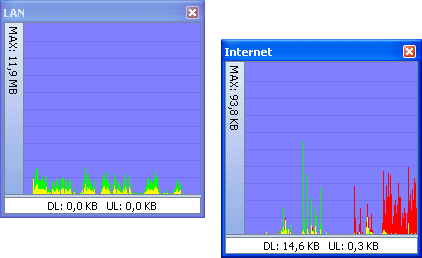 BWMeter provides excellent LAN and Internet usage facilities. I especially like the graphics and the ability to specify the location folder where the data will be stored. Also, the ability to 'collect' usage data from other individual BWMeter equipped pc's on the network is very cool. However, shortly after I paid for the discounted v4.x.x upgrade, available to previously registered users, BWMeter began to freeze my Vista pc on every startup, so I had to uninstall! The problem is incompatibility with Kaspersky IS 2009, for which Desksoft take the easy way out and blame Kaspersky: In my communication with Desksoft, and their Russian programmers, it seemed that they couldn't differentiate between KIS 2007 & KIS 2009 - so sadly, don't hold your breath waiting for a fix from Desksoft! Thanks for the advice, ajua, but I was deleting the LAN graph. The problem is that the associated file on disk (LAN.gph) does not get deleted, as it should. So, when I'd delete the LAN graph, the interface would make it seem as if it was gone, but when BWMeter was restarted, it read the LAN.gph file anew, and the LAN graph would still appear. BWMeter 4.1.1 is out now, and the issue is still there. The solution is to close BWMeter and manually delete x.gph (and only x.gph), where "x" is the name of the graph you want to permanently remove. You didn't have the graph size issue because your BWMeter configuration differs from mine. Once I figured out the workaround noted above (i.e. manually deleting LAN.gph), the problem went away. Users of versions prior to 4.1.0 who wish to update may not be happy to find that they need to uninstall BWMeter and delete all their existing settings, and reconfigure everything from scratch. This seems to have been improved going forward (starting with 4.1.1), since the author has made it so this won't have to be done again.